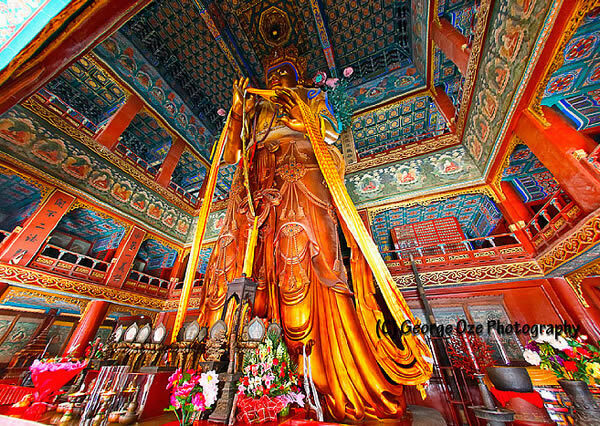 In the main hall of the Lama Temple in Beijing stands a huge, 18-meter tall Maitreya statue. Hand-carved during Qianlong Emperor’s reign of the Qing Dynasty, the statue stands tall and mighty. The Cultural Revolution in the 1960s caused tremendous and irreparable damage to thousands of architectural and cultural treasures across China. Miraculously, both the statue and the temple survived the calamity. During the Cultural Revolution, three red guards came to the temple to smash the statue. The first one went on the walkway and slashed the chain with an axe. The axe landed on his leg instead. The second one picked up the axe and again slashed. He missed and fell to the ground. The third one was too shocked to do anything, and all three left without harming the statue. Reportedly, none of them lived long after the incident. Thereon, no others dared to return and the statue remained intact. When you hear the word “masterpiece,” you most likely think of some famous painting painted in the 15th or 16th century like the Mona Lisa. So it’s always nice to know that artistic masterpieces are being created even today. 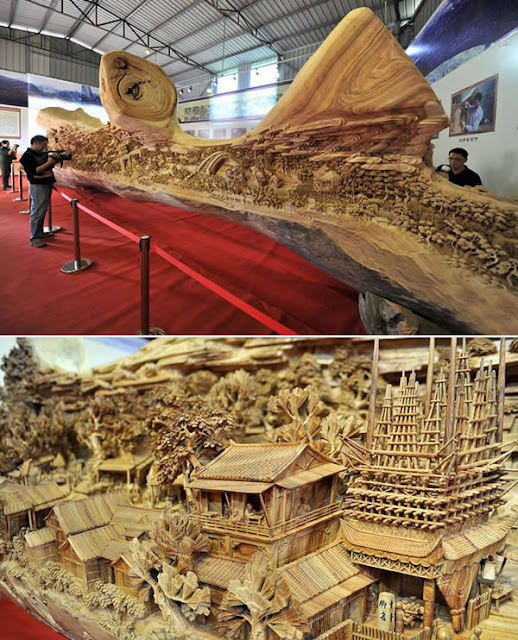 Take, for example, Chinese artist Zheng Chunhui’s breathtaking 12.2-meter-long (over 40 ft) wooden carving – it is a modern masterpiece of wood sculpture. There are lots of things about Chunhui’s amazing sculpture that make it unforgettable. It has entered the Guinness Book of World Records as the longest continuous wooden sculpture in the world – it was carved out of a single tree trunk. Between its size and its intricate detailing, it’s no surprise that it took Chunhui four years to complete it. The sculpture features buildings, trees, mountains, rivers, boats, bridges, clouds, and even 550 little individual hand-carved people. Chunhui’s sculpture takes a slightly new twist on the Chinese tradition of enriching and adding on to ancient masterpieces. The scene it depicts is based on “Along the River During the Qinming Festival,” a long scroll painting by Chinese artist Zhang Zeduan that is almost 1,000 years old and depicts the lives of both the rich and the poor during the Qingming Festival. Other chinese artists throughout the ages have reinterpreted and added on to this work with cultural elements from their own centuries. Lednice Castle and its extensive garden are among the most beautiful areas in the Czech Republic. The gorgeous exterior promises a stunning interior—original panel ceilings, historic wooden furniture and an impressive 360-degree spiral staircase made without using a single nail, which connects the library with a stately bedroom. 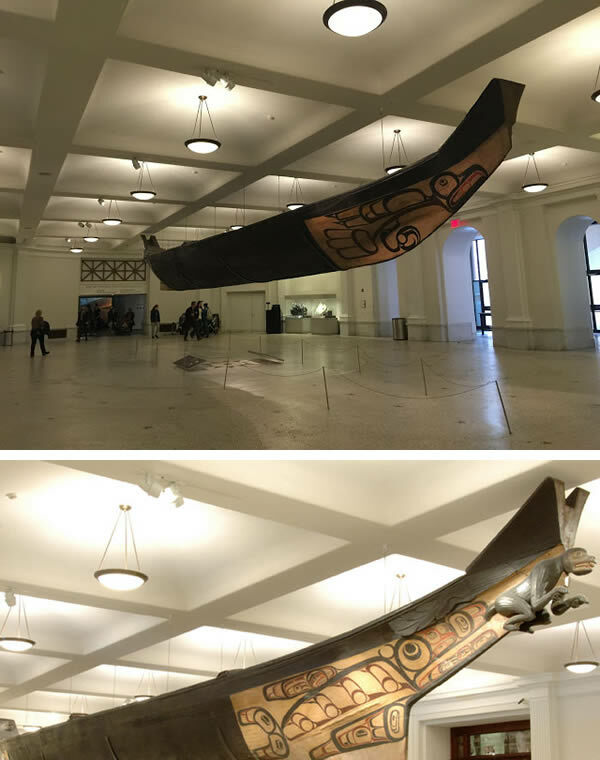 The Nisga'a and Haida Crest Poles of the Royal Ontario Museum are four large poles carved from western red cedar by the Nisga'a and Haida peoples of British Columbia. Each of the crests tells a family story, and their carved figures commemorate family histories by describing their origins, achievements, and experiences. C.M. Barbeau acquired the Nisga'a crest poles, and the Royal Ontario Museum received them in the early 1920s. However, due to their large size, they could not be put on display until an expansion of the museum in 1933, when the building could be constructed around them. Notably, the largest of the four crest poles, the Pole of Sag?aw?een, stands over 24.5 meters (80 ft.) and is the tallest known example of a pole from the 19th century. Sculptor Dengding Rui Yao has carved this incredible wooden lion from a single tree trunk. The artist led a team of 20 assistants on a three-year journey to complete the sculpture, which was made in Myanmar and was transported to its permanent home at the Fortune Plaza Times Square in Wuhan, China. 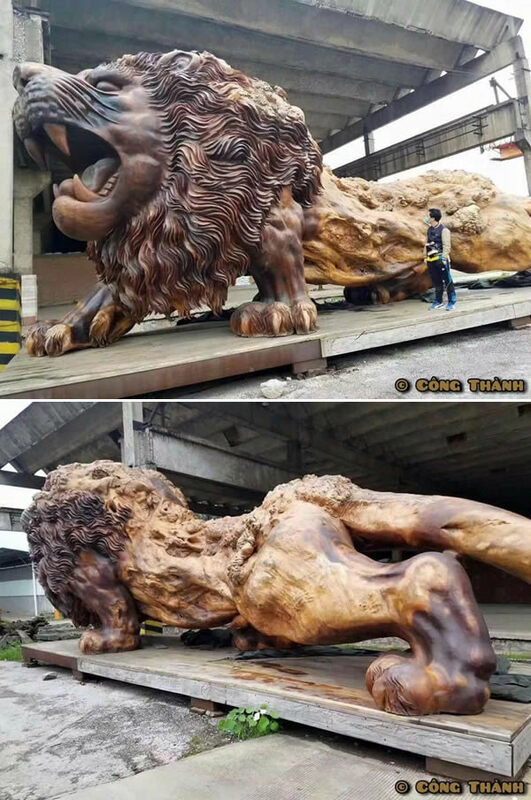 According to Woodworking ideas, the lion was carved from a rosewood tree and measures 14.5m (47.5 ft) long, 5m (16.4 ft) high and 4m (13.1 ft) wide. If those measurements are true it would make the lion the longest wood carving in the world, which is currently held by this artwork that we featured back in 2013. I just checked the Guinness World Records’ website and Chunhui Zheng’s sculpture is still recognized as the longest so the lion still has yet to be officially verified or the exact dimensions are incorrect. Regardless, it’s an incredible work of public art that you should definitely check out if you ever find yourself in Wuhan, China. As the story goes, Ernest “Mooney” Warther was a boy growing up in Ohio when he encountered a man who taught him how to carve a pair of working pliers from a single piece of wood—using just 10 cuts. Whether it was that single epiphany, or the machinations of his incredibly inquisitive mind, Warther would quickly become one of this most notable wood carvers in America. Warther’s most significant carving before he changed his focus almost exclusively to locomotives, was a tree created from 511 interconnected pliers using the same technique he learned as a child. 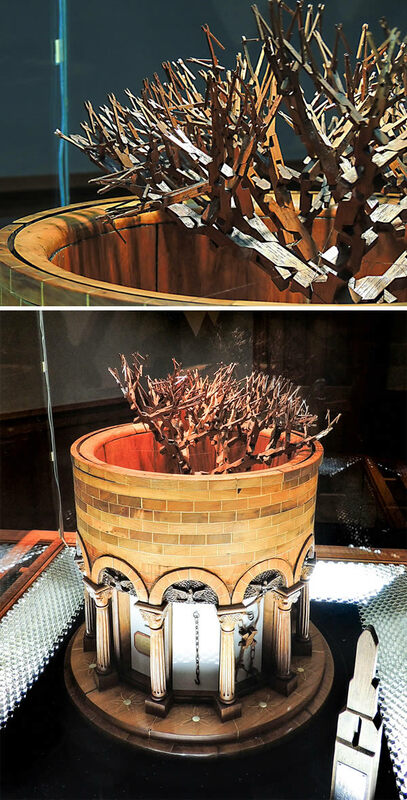 The piece required some 31,000 cuts and each branch can fully articulate like a functional pair of pliers all the way down to the base of the trunk. Watch the video above to see Warther’s son David demonstrating the technique (seriously, it’s almost miraculous at the end, well worth a quick watch). 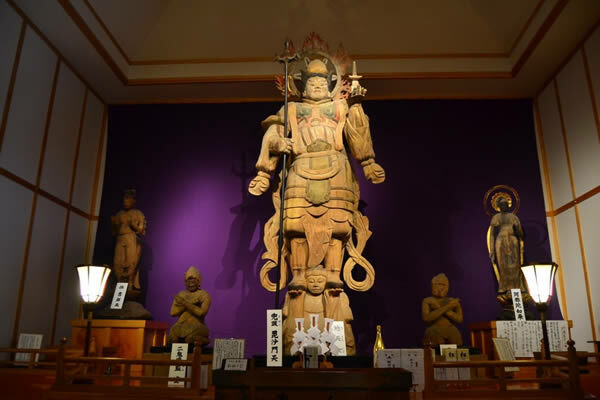 Kumano Shrine Bishamondo is home to the largest wooden statue in Japan of Bishamonten, the God of War. It was designated as an important cultural asset in the 1970s and moved from the Bishamondo (former wooden hall dating from the medieval period where this statue was originally installed) into an exhibition hall with other statues. This shrine that has stood for more than 1,000 years in the country hills outside of Towa City secretly guards many stories and items of interest in its ancient precincts. 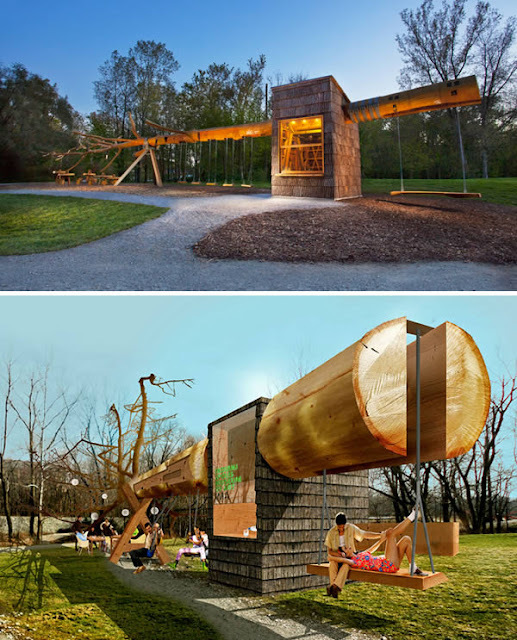 INDIANA – Swedish firm Visiondivision created a swing set and concession stand commissioned by the Indianapolis Museum of Art largely from a single 30.5-m tree. 'Chop Stick' was designed for the Virginia B. Fairbanks Art and Nature Park in Indiana, USA, from a yellow poplar tree harvested from a nearby forest. ‘Our project is about trying to harvest something as gently as possible so that the source of what we harvest is displayed in a pure, pedagogic and respectful way – respectful to both the source itself and to everyone visiting the building’, say architects Anders Berensson and Ulf Mejergren. The tree was harvested and shaped to preserve the size and shape as naturally as possible. Bark was carefully stripped and dried to be used as shingles for the concession stand and hanging ornaments for the branches. The structure of the stand itself also comes from the tree - Pieces of wood were cut from the trunk to create the stand’s frame and the swing sets, and even the flowers found on the tree were used as ornaments in the concession stand’s glass. 0 Response to "9 Awesome Wood Carvings"